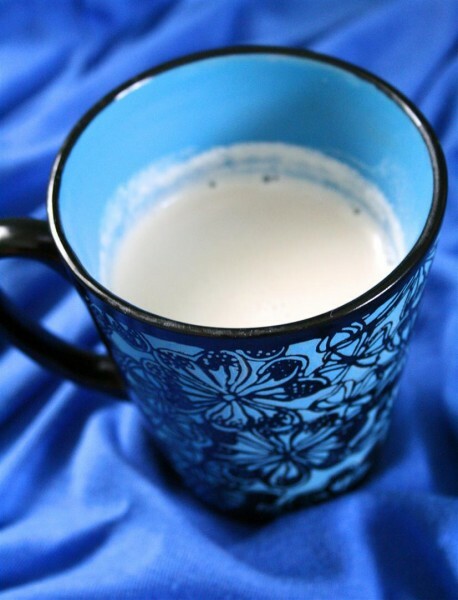 Hot Vanilla Milk was posted on June 12th, 2011 and is filed under Dairy Free, Desserts, Drinks & Smoothies, Gluten Free, Low Carb, Recipes, Snacks, Vegan. This entry has 14 comments. You can follow any responses through the RSS 2.0 Comment Feed. I think I’ve discovered a secret. It concerns my dreadful mid-afternoon cravings for something sweet. Come on, don’t make me feel alone and pretend that your sweet tooth doesn’t ever kick in. If we all just admit that the four-year old in all of us likes sweet things, we’ll all come out of denial and be so much the happier. ….Okay, maybe there are some of us that have no sweet teeth and eat broccoli every meal, but that is not me. It’s something I’m constantly fighting…okay…giving in to. BUT…there is a happy medium. I may give into something sweet, but it’s not necessarily bad. The trick is to be prepared when those cravings come and swap a sugary craving for a healthy, SWEET craving. It’s all about substitution. I don’t like to be all about self-deprivation when it comes to food. With me, it ultimately back fires…once I start telling myself I can’t have something that’s all I want. Ridiculous, I know. There are so many things we can use to substitute our naughty cravings. Say, dark chocolate over milk chocolate. A thick, chocolate smoothie over a milkshake. A baked apple with cinnamon instead of apple pie. …And instead of hot chocolate…Hot Vanilla Milk! This is my new secret! It’s super low in calories, healthy, vegan, and tastes sweet! It’s something that I can just sip and savour slowly; instead of just popping a chocolate in my mouth…I’m in love with it! Serves 1. *I used my homemade almond milk, but I’m sure it would be fine with store bought. Just know I used this recipe! Steam all the ingredients over medium on the stove. Bring to a light boil, beating it briskly with as small whisk so that the milk gets foamy. Garnish with a little nutmeg, cocoa, or cinnamon and there you have it. Instant. Sweet. Gratification. There’s something so comforting about cuddling a hot mug of something. So cozy. What are your healthy swaps for sugary cravings? Oooh, I love a good steamer, and having one mid-afternoon sounds perfect. Great idea for that crazy afternoon craving! You are not alone, my friend. :) My inner 4 year old comes out maybe every hour. Actually, I think I just am my inner 4 year old. Anyway, this looks like a delicious recipe. :) I love almond milk, love vanilla milks…yum! I bet this would also be good with other flavors/ extracts (like coconut etc) and if chocolate milk is what is desired, I bet some raw cacao powder (or even unsweetened cocoa powder) would do the trick (and still be relatively low cal). Yum yum! I am totally with you on this, I definitely have my share of sweet cravings! If I want something kind of sweet, I will go for a chocolate protein smoothie or a baked sweet potato with nut butter + honey but if I have a big sweet craving, I usually give and make something more decadent – lately I’ve been loving the chocolate and PB combo in a cake! We have a sweet snack in Lebanese culinary traditions which I resort to sometimes (when I don’t want a chocolate bar); it is what I called lebanese caramel and it is a mixture of tahini and carob molasses; i posted on it. Your vanilla milk in that mug looks like it would be a delight to drink especially on a cold and drizzly afternoon. I’ll admit too that I get sweet cravings in the afternoon. I always have a cup of tea after lunch and I feel you just have to have something sweet to go with it. But maybe instead of a piece of chocolate I’ll try to behave and have a cup of hot vanilla milk instead. What do you think about adding a little cinnamon in with it? I love the mug you’ve served it in! Serena~ Oh, yes! I have my mind set on some fun flavours! It’ll happen! You are welcome back anytime!!! Nora~ That sounds really, really good! Now I want sweet potatos. Tasteofberuit~ Intriguing. I have never heard of anything like that…that’s neat! Jessica~ I think I need to try that! I have some macca on hand. Juanita~ Oh yah! You could totally replace almonds with cashews, foh sure! Actually, cashews would be a very creamy milk. Yum! And only 66 calories, you had me at hello! Chris~ That sounds fantastic…cinnamon would be yummers too! what is vanilla essence? is it like vanilla extract? i don’t have a clue. thanks!